As part of our Chartwells philosophy we strive to help educate young children about the importance of eating a healthy, varied diet through a range of fun and engaging activities at school. 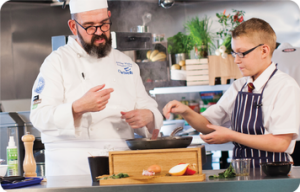 We know that helping children to make the best choices now and to learning things now like how to cook will be what they take with them into adult life. 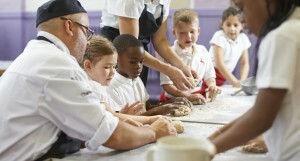 We also know the best way to help them learn is by making it exciting and interactive which is why we have activities such as Cooking in the Classroom. 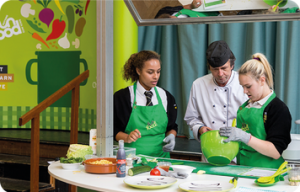 Our ‘’Putting Fun Back into Food’’ team are dedicated to delivering a whole range of classroom activities such as Cooking in the Classroom and work in partnership with schools to create the programme that’s just right for them. 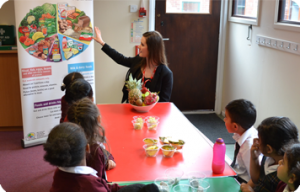 We don’t just deliver really fun activities though – we also provide teachers and teaching assistants with access to our Nutrition Smartboard. It’s a free resource which helps with lesson ideas and classroom activities to support in promoting an active lifestyle and balanced diet. Cooking in the Classroom Nutrition Assemblies and Workshops On Your Marks, Get Set, Cook! Enjoy a theme day with us!Keep Filling Up!